Washing your horse can be fun and frustrating! Accept that you are probably going to get wet. Everyone has their own way, everyone finds the best way to clean their horse – this is how I do it. I have a grey and a chestnut horse at the moment – unsurprisingly the grey is a lot harder to get clean. I start off by giving them a good groom – getting off as much mud as possible when it’s dry rather than wetting it and spreading it about. I then chase them with the dreaded water snake – the hose pipe. The chestnut loves it, the grey hates it and dances around. I’ve just learnt to move quick and keep going, he’s only being mardy and the quicker I get him wet all over the quicker the nasty water snake leaves. 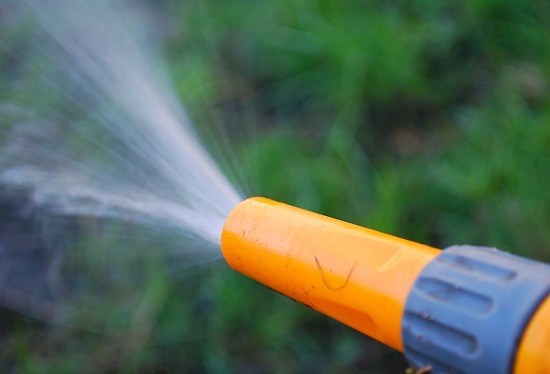 If you don’t want to hose you can wet the coat with water from a bucket and a sponge, this does take longer though. When you’re horse is wet all over I usually start on the mane. I put shampoo directly onto the mane and then use my hands to massage it in. Sometimes this will need doing more than once depending how clean the mane is and what colour it is. I then work down the neck whilst there’s shampoo foam usually already on it. I repeat the same method – I put the shampoo directly on the coat and then massage it in, either with my hands of a clean sponge. 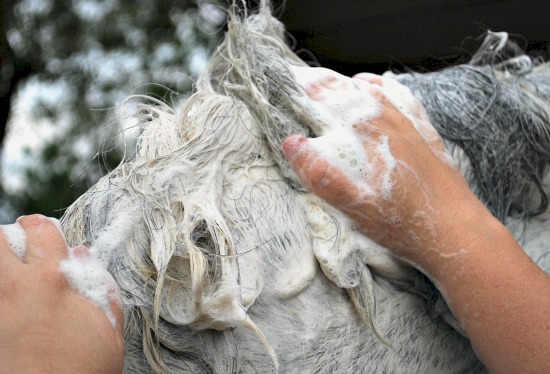 When the neck and mane are clean I immediately rinse the excess shampoo off with the hose so that I can look at just how clean it is and whether it needs washing again – it also starts to get rid of the excess shampoo. I then move down the body, one side at a time repeating the same process. When I’m happy with the body I usually then clean the legs and feet – these are done one at a time, always being aware that they’re very delicate and prone to moving quickly. 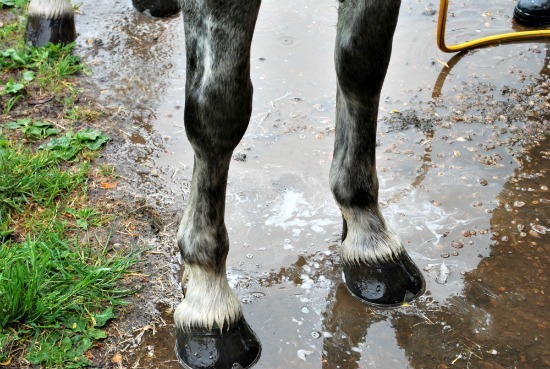 When the bodys clean I get my sweat scraper and scrape off any excess water – this allows the horse to dry quicker. When all that’s done, the grand finale is the horses tail. I use the hose to drench the entire tail from top to bottom. I then put the shampoo directly onto the tail and scrub with my hands. I rinse and then repeat. My grey has a white tail and needless to say this has to be done over and over again to get clean. When the tail is clean I give it a spray of a mane and tail conditioner and use a curry comb to comb through. 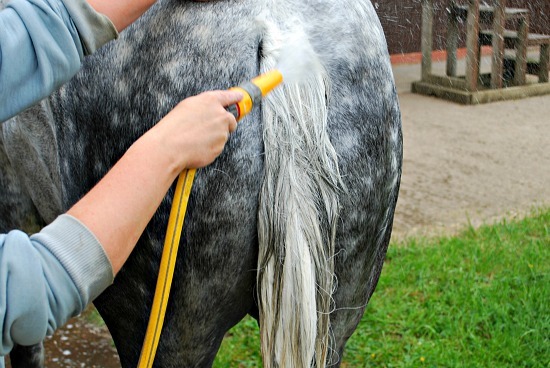 You may also want to give your horse’s coat a spray with a coat shine spray – don’t go over the top with this though, especially around the saddle area. If you put too much on your pony will look lovely but you mane be prone to clipping off! How do you wash your horses face? I try a combination of a wet sponge and brushes….. Make sure you’re gentle around the eyes. My gelding throws a mardy, my mare loves it. Every horse is different I suppose. I know some people who swear by wet wipes. Good luck. How often would you wash them in this way? I would wash like this in summer ready for a show… Sometimes, however depending on the colour and cleanliness of your horse u may able get away with spot cleaning and a very good groom. Thanks for your tips…..now to get wet.